What happens to your skin when you get sunburnt? 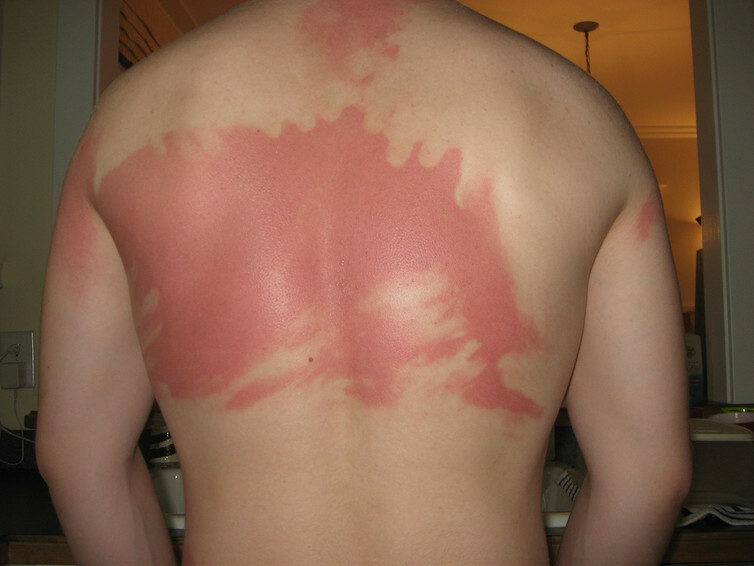 Most Australians are familiar with the painful red skin, blisters and peeling that follow too much time in the sun. Last summer, 2.4 million Australian adults were getting sunburnt each weekend. But what’s actually happening in the skin during a sunburn? Sunburn is a radiation burn, caused when the ultraviolet (UV) rays of sunlight damage DNA in the upper layer of skin cells. The sun emits three kinds of UV radiation – UVA, B and C.
UVC is mostly absorbed by the earth’s atmosphere, but UVA and B rays reach the ground and can penetrate unprotected skin. 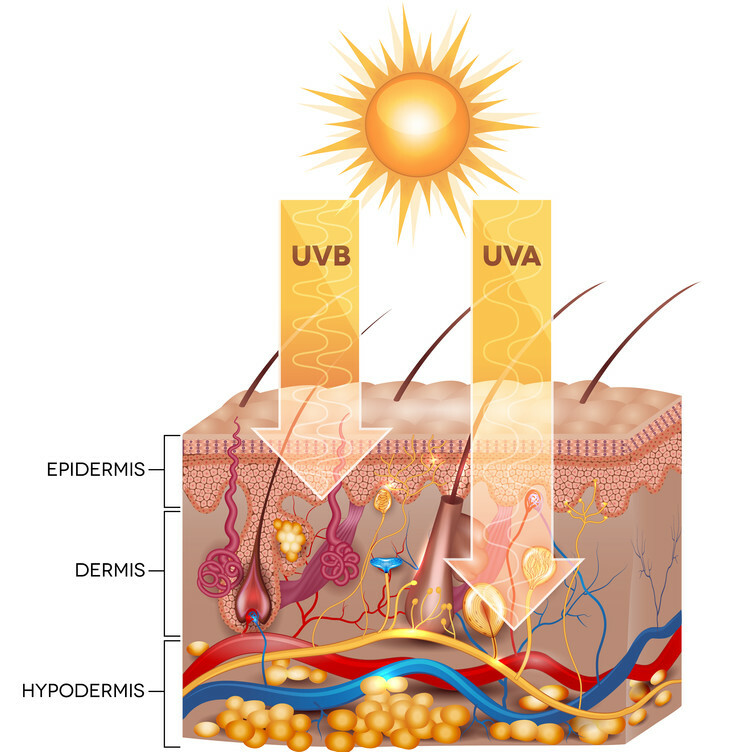 UVB penetrates the epidermis, the top layer of the skin, while UVA goes deeper. The particles that transmit light (photons) from UVA rays interact with the skin and this damages the skin’s proteins and membranes, as well as DNA. Photons from UVB rays are absorbed by DNA itself, and the extra energy can cause some of the DNA to link up incorrectly. This stops accurate DNA replication, so cells start repairs to try to fix the mistakes. Too many DNA errors overwhelm the cell and cause it to begin to self-destruct, to remove cells that can’t be safely replicated. Once the cells of the top layer of skin (called keratinocytes) detect DNA damage in themselves, they begin producing molecules to attract immune cells into the skin. This causes the skin’s blood vessels to leak into the spaces between cells and other skin structures. It’s this extra fluid and the swelling it causes that lead to the red skin, hot sensation and painful sensitivity of freshly sunburnt skin. Immune cell invasion begins while you’re still sitting on the beach, but increases about an hour after you come in from the sun. The process peaks 24 to 48 hours later, which is why the redness and painfulness of a sunburn can keep developing for a couple of days. Some of the immune cells start cleaning up skin cells in self-destruct mode, while others release chemicals that further damage weakened cells. Their actions may also trigger a kind of allergic reaction that makes the skin itchy. Within several hours, blisters form where whole layers of keratinocytes have been killed. The dead layer lifts away from the layers underneath, and the space between fills up with the fluid that has leaked into the skin. Once inflammation subsides, the lower layer of skin cells begins to grow quickly to replace the dead cells. Post-sunburn peeling is large sheets of dead cells being shed from the upper layer of the skin to make way for this new growth. DNA damage also causes the cells in the upper layer of skin to signal the cells that produce melanin (the pigment that gives our hair and skin its colour) to get to work. This is what provides the tan that can come after the redness has faded. The melanin settles over the skin cells to shield them from future UV exposure. But don’t rely on your tan to fully protect you next time – it’s only as protective as SPF 2 sunscreen. There’s nothing you can do for sunburn except giving the skin time to heal itself. In the meantime, you can relieve the discomfort by staying out of the sun, drinking plenty of water, applying a cool compress, and taking over-the-counter medications such as paracetamol. If the pain can’t be managed by these measures, or there is extensive blistering, nausea, fever or dizziness, it’s time to see a doctor. Once your sunburn has subsided and you’re thinking of venturing out again, you can best avoid another painful bout by using sun protection whenever the UV index reaches three or higher. This usually happens daily from September to April in the southern states and all year round further north. Use the SunSmart app to find out today’s UV index and sun protection times in your area.